EYECONIC.TV’s Digital Loyalty Kiosk provides your customers with an engaging digital display. Allowing them to join loyalty programs, sign up for special rewards, redeem coupons, and much more. Our Loyalty Kiosk is easy to deploy and are custom tailored to suit your brand and your business. Completely eliminate the need for paper/plastic punch cards that are easily misplaced and forgotten. Give your customers the opportunity to earn loyalty rewards, participate in mobile contests, and receive special offer updates in real time! 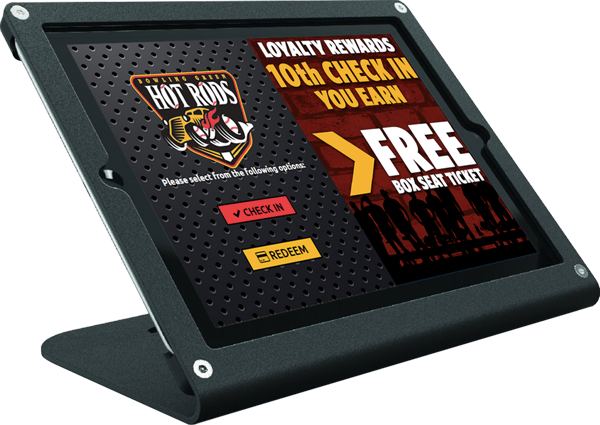 Use our Loyalty Kiosk System to create a database of customers that are eager to receive loyalty rewards, promotional offers, coupons, and crucial updates. Your customers can redeem any reward they receive from your business directly through our Loyalty Kiosk system. The best part is, all of the data is tracked through our swanky “behind-the-scenes” software and sent directly to a customer database we provide for you. Allow our software to do all the heavy lifting for you. 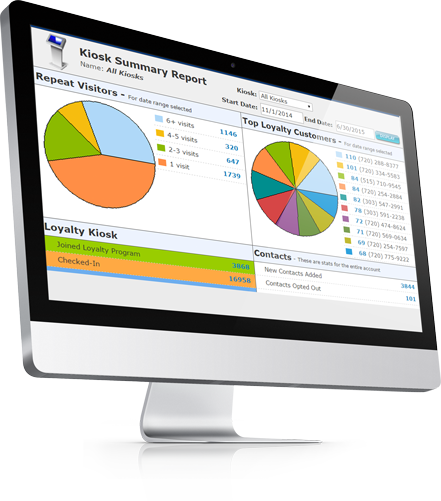 Each time a customer uses your Loyalty Kiosk their action is stored on a remote database that we provide for you. We also provide you a custom username and password to access the data with no strings attached. 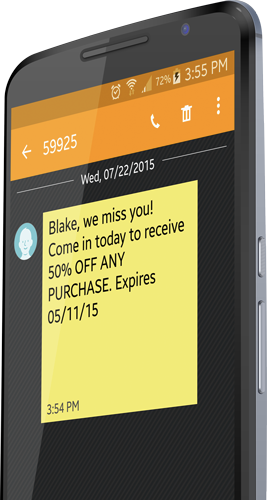 Produce detailed analytics, view coupon redemption rates, and even send out massive message blasts to every contact in your database! Eyeconic.TV’s loyalty kiosk solution gives you the power to market directly to your customer’s cellular device(s). Each new customer adds to your database so you can market them with special offers down the line. Over 90% of American adults possess a cellular device. Take advantage of this mobile marketing opportunity and keep your customers in the loop. Customers willingly adapt to Loyalty Programs that offer an incentive for them to return to your facility. Mobile marketing gives you the power to communicate special offers to your customer’s cellular device(s) in real time. Creating a mobile marketing campaign has never been easier. Gone are the days of paying costly printing costs for tangible punch cards. Impress your customers by implementing a Loyalty Kiosk system in your facility. For a FREE quote, to find a dealer near you, or if you have any questions about our products or services, contact us for more information!